Rusted Metal Howling Coyote Garden Sculpture... Coyote Facts: The coyote is one of the few wild animals whose vocalizations are commonly heard, & the howling of the coyote is truly a song of the West. One of the most adaptable animals in the world, the coyote can change its breeding habits, diet & social dynamics to survive in a wide variety of habitats. 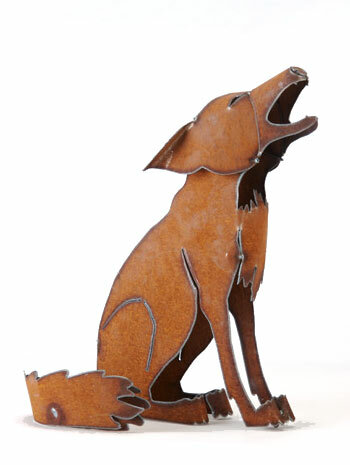 All of the rusted metal garden art sculptures in the Henry Dupere collection can be used to add a touch of distinction to any garden or home decor, including this classic rusted metal Howling Coyote! Henry Dupere Howling Coyote Garden Sculpture. 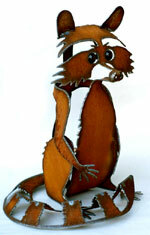 Size: 20" tall x 14" wide (side of tail on left, to right).